QUERER ES PODER// Hace's Lehigh II Apts. Community Room On MLK Day. Philadelphia – Dr Martin Luther King’s “legacy of community service” was recalled by Maria N. Gonzalez, the President of the Hispanic Association of Contractors and Enterprises (HACE), during ribbon cutting ceremonies, Monday, of a multifaceted Community Room in their Lehigh II Apartments at 2622 – 44 N. Lawrence Street, below Lehigh Avenue between 4th and 5th Streets. 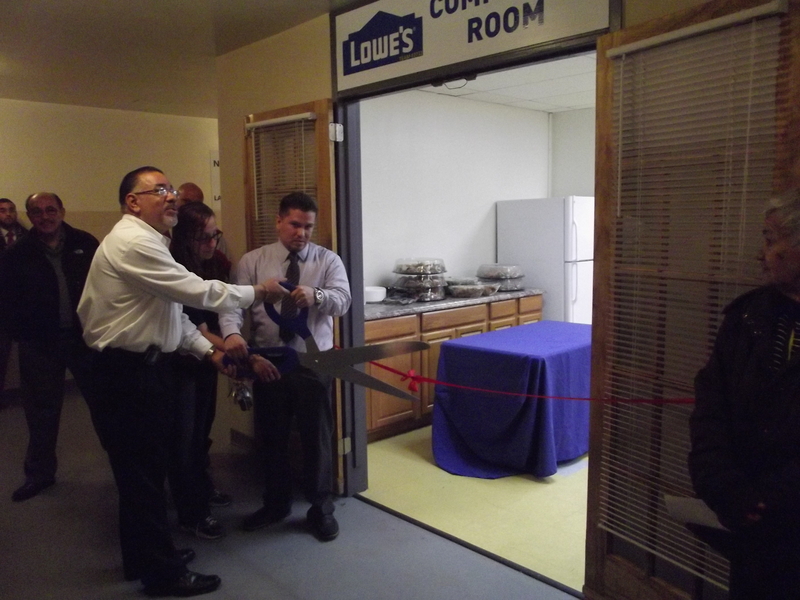 A Marine Veteran, Mr. Gonzalez additionally suggested that the “team” effort behind the creation of the community room resonated with lessons he learned in the military: “Without a team you can’t get anything done.” He added that it was the commitment of Lowe’s Manager Patrick Kirby and the “can do” attitude of Site Manager Frank Campos that made the ‘Lowe’s Community Room Lehigh II” a reality. “We’re very fortunate at HACE to have a dedicated staff, board, volunteers and partners that support us in our mission,” said HACE Pres. Maria Gonzalez. “The police can’t do it alone and we can’t arrest our way out of problems,” said Officer Correa. ‘We have a lot more to do,” said David Gonzalez, “and part of our mission is going to be focused in the next year to be to do a lot more with Lehigh I and we’re going to continue to do that and let nothing get in our way. The Friends of the Free Library of Philadelphia, Barnes and Noble, Toys-R-Us and Wal-Mart also made contributions of supplies and equipment to refurbishing the Lehigh I and Lehigh II Developments. Juvencio Gonzalez Named to Staff of Sen. Michael Stack. Philadelphia – Looking to better outreach efforts to a rapidly growing Latino community in the Philadelphia area and statewide, State Senator Michael Stack (D-Pa.) has tapped Juvencio Gonzalez to serve as a Legislative Aide and liaison with the Latino community. 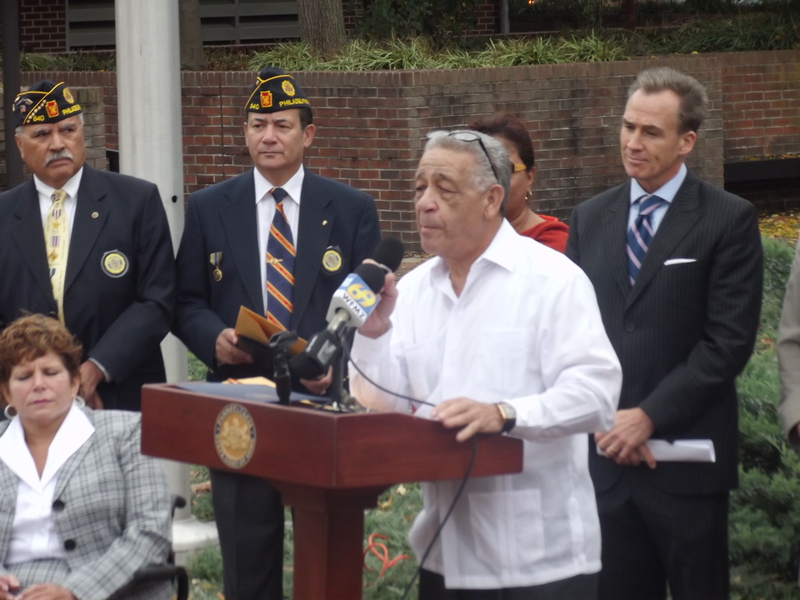 A Media Consultant, Veteran U.S.M.C., and former advisor to Governor Bob Casey, Sen. Stack noted that Mr. Gonzalez is “highly respected” throughout the Hispanic community, and recalled working with Gonzalez on several issues, including a resolution on behalf of the Borinqueneers, 65th Infantry Regiment, the naming of a stretch of highway after Police Officer Brian Lorenzo and local job development. “I’m very excited” about the appointment, said the State Senator, adding that he anticipates Mr. Gonzalez will “really excel” not only in his role as a liaison with the local Latino community, but in “building bridges” with Latin American countries like Brazil, Chile and Mexico. “He can have a large impact,” on a variety of other issues, including education, job development, and the needs of veterans. Having already announced his candidacy for Lt. Governor, Sen. Stack’s appointment of Juvencio Gonzalez comes in the wake of a summer that witnessed demonstrations outside the Broad Street office of Gov. Tom Corbett. What were widely perceived as cavalier and dismissive remarks about the absence of any Latinos on his staff, prompted an immediate backlash from several community activist. “Juvencio has a long history of providing constituent services for the city and state, and will be a valuable member of his team,” said Councilwoman Quinones Sanchez. Not unlike former Gov. Bob Casey, who Mr. Gonzalez worked with in the early 1990s, Sen. Stack has a record as a staunch defender of labor and the rights of workers, most recently demanding Gov. Corbett and other local officials “take action” to forestall the closure of the former Nabisco/Kraft factory on Roosevelt Blvd., where more than 300 workers are slated to lose their jobs. The Fifth District Senator has pushed for infrastructure investment, in a proposal that would provide funding for “crumbling” roads, bridges, and mass transit, and would create 60,000 jobs. A critic of wasteful spending, Sen. Stack has also decried as a “fiasco” the Corbett administration’s spending on an effort to privatize the state lottery. Meanwhile, the Senator has also urged local electricity providers to delay electricity shut-offs, recognizing a brief interval can often allow customers to make timely payments.